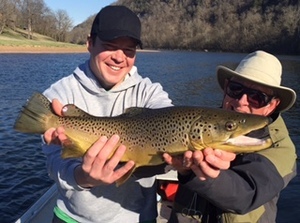 I headed back to the White River with hopes of catching some bigger brown trout than yesterday. I was disappointed. I only got 6 browns most of them were 19-20" and nothing to brag about. We did take some time and catch 30-35 rainbows but nobody wants to hear about that. I had several other boats on the water and everyone struggled. Pressly only had 5 brown trout but he had the biggest of the bunch at 23 1/2 inches. Tomorrow is a new day and I will be back on the White River with a two day slump to break.